Get Up and Glow Radiance & Energy Booster is a revitalising and energising serum that brightens the skin by increasing cell respiration. It is enriched with youth-boosting nutrients and peptides that visibly illuminate. OSKIA’s unique dual approach actively brightens and firms, evens skin tone, smoothens the appearance of fine lines and protects against everyday environmental, seasonal and lifestyle damage. Providing essential cell nutrients to help improve cell health in the long term, this refreshing serum leaves skin looking healthier and smoother, with a youthful, radiant glow. Pump into a clean palm and apply gently to entire face and neck underneath your moisturiser. Can be used as a replacement to daily moisturiser or on top of make-up for an extra radiance boost, in which case pat the serum onto the skin rather than rub. Ribose - Known as the Beauty Sugar, immediately energizes, revitalises and brightens by boosting oxygen intake to recharge cell energy ATP to benefit all cell processes. Galactoarabinan - A vegetable alternative to collagen, helps reduce fine lines and wrinkles. Milk Peptides - Immediately lift, firm and tone the skin leaving a natural sheen and radiance. Full Ingredients: Aqua (Water), Methyl Sulphonyl Methane (Msm), Glycerin, Sodium Hyaluronate, Benzyl Alcohol, Whey Protein, Zinc Glycine, Ribose, Malus Domestica Fruit Cell Culture, Limonium Narbonense Flower/Leaf/Stem Extract, Saccharomyces Ferment Filtrate Lysate, Galactoarabinan, Panthenol, Biosaccharide Gum-1, Inulin, Alpha-Glucan Oligosaccharide, Petasites Japonicus (Butterbur) Root Extract, Parfum (Natural Fragrance), Citronellol, Geraniol, Linalool, Chondrus Crispus (Carrageenan), Lecithin, Xanthan Gum, Tocopherol, Dehydroacetic Acid, Phenoxyethanol, Lactic Acid, Potassium Sorbate, [ /- May Contain: Caramel, Mica, Ci 77891 (Titanium Dioxide), Ci 77491 (Iron Oxide), Ci 75470 (Carmine), Silica]. 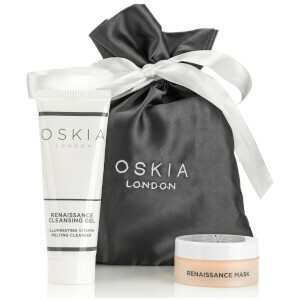 Oskia Renaissance Duo when you spend £65 on Oskia. I love this product, it has a wonderful texture when applying and leaves my skin feeling fresh and bright!